EA's attempt to revive a storied series isn't going as well as it planned. EA's Medal of Honor: Warfighter has some pretty stiff holiday competition, including a new Halo title and, of course, Call of Duty looming on the horizon, but its first week U.S. sales numbers are even lower than most predicted: 300,000 units. Current worldwide estimates put sales at just over 500,000. Compared to 2010's Medal of Honor title, which sold over 2 million units in its first two weeks, those numbers aren't making anyone at EA very happy. Warfighter has taken it on the chin from critics far and wide, with complaints ranging from game-breaking bugs to a weak storyline. The game currently holds a Metacritic rating in the mid 50's, reflecting a general consensus that the new title - and perhaps even the franchise as a whole - is stale. The poor retail numbers aren't a surprise to EA, and the company knew right away that the game wasn't off to a great start. In the company's own financial projections, CEO John Riccitiello warned that earnings would be "soft" thanks to Warfighter's lackluster performance. 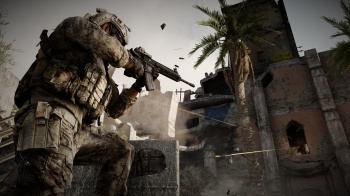 EA's plan to compete with Activision's Call of Duty series has been to launch new iterations of the Medal of Honor and Battlefield franchises in offsetting years, much like the flip-flop release schedule of the Modern Warfare and Black Ops flavors of Call of Duty. If this year's reviews and sales figures are any hint of the future, this strategy will need some serious tweaking.